We don’t live on the east coast, but that doesn’t mean we can’t enjoy what will be our patio (see the dirt behind the chair?) on our new adirondack chair(s). I’m still working on the second, but this one, besides needing some waterproofing, is definitely usable. Surprisingly, I was even able to finish another 3 oz. of Corriedale top that we dyed up. This is 2-ply and approximately 330 yards. I’ve got two more dyed bundles of this (different colors), that will hopefully be spun around the same weight (if I don’t fall out of practice from all the woodworking I’m doing), so I’ll end up with four yarns of about the same weight and yardage to use together (or separately, if Virginia decides she wants to use one). 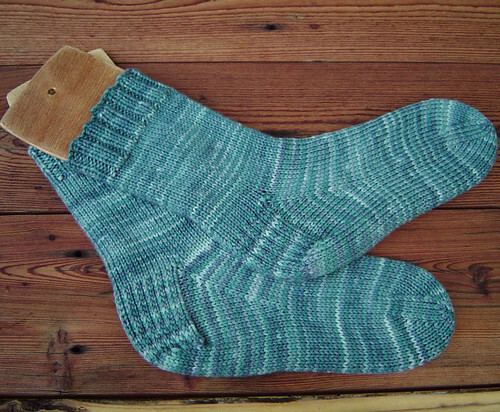 Speaking of Virginia; she’s finished another pair of socks knit from some worsted weight wool that she dyed up awhile ago. Knit on size 3US needles, they have a denser fabric to help make them wear longer. That chair is amazing. Very pretty. And squooshy blue socks! Beautiful spinning and a fantastic looking chair. okay…the gorgeous house-related projects have got to stop. I’m turning green with envy. 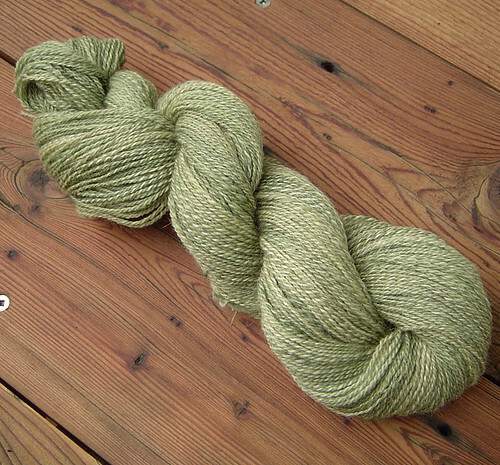 When I see beautiful spun yarn or fabulous mittens, I can think, “Hey, maybe someday I’ll be able to do that…”. 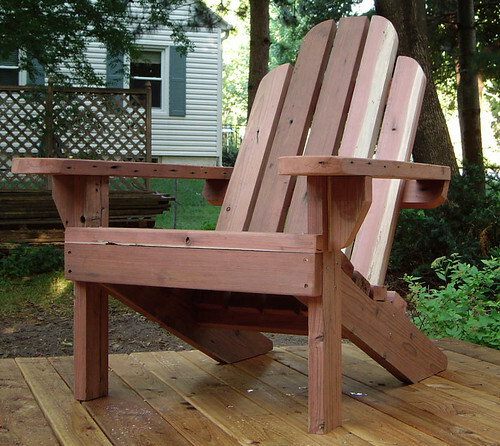 But when I see Adirondack chairs, there really is no hope left for me. Amazing craftsmenship. Can’t believe I was shoveling snow off of that wood what seems like a few months ago.